…. is simply the nicest way to build your collection of Bustle & Sew patterns and it’s a jolly good read too! Subscribe now to receive your first issue and a very special free gift as well to celebrate our 100th issue! The Bustle & Sew Magazine is a digital publication that’s emailed direct to your inbox on the last Thursday of every month. Every issue of the magazine contains SIX original Bustle &amp; Sew designs (not all of which will be later made available for individual purchase, but will remain exclusive to magazine readers). 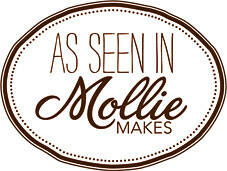 Techniques and projects include hand and freestyle machine embroidery, applique and softies as well as being packed full of additional articles and features including “Meet the Maker”, baking and recipes, home and lifestyle features, best of the web and so much more. When you subscribe you’ll receive the current issue (below) straight away…..
Why should I subscribe, rather than purchase individual copies of the Bustle & Sew Magazine? You’ll receive a great discount on the price of individual magazines. Your magazine is delivered to your inbox on the last Thursday of every month as a pdf file which can be easily and quickly saved to your computer, ready to print and use whenever you wish. Don’t forget we’re more than just another sewing magazine – though sewing is at the heart of every issue, we also include recipes, lifestyle features and much more besides, celebrating everything we love about life here in the English countryside that we’re sure you’ll enjoy too! After listening to some of our lovely customers’ comments, we have two options for subscribing – monthly and annual. The price of a monthly subscription is just $5.50 each month. 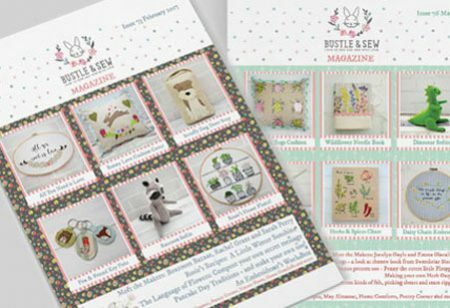 Each month you’ll receive SIX new Bustle & Sew projects, sewing hints and tips, features, articles and much more. You’ll be first in line to hear about new products and offers, many of which are limited as we’re only a little company and we aren’t always able to meet demand for our kits and panels. Please do be reassured that you’re not committed to continuing your subscription. You can cancel your monthly membership whenever you wish with no penalties AND keep your free gift as my way of saying “thank you” for trying us out. However, I do hope you’ll enjoy it and decide to continue with your subscription. If so, then you need do nothing and your membership will continue to be billed at just $5.50 each month. You are completely in control of your own subscription. Some readers told us they prefer not to have monthly payments coming out of their account or that they were looking for an even better value. We listened, and are now able to offer you the opportunity to subscribe for one year for just $35! 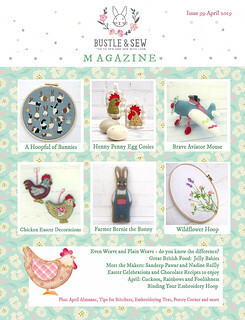 The price of an annual subscription (12 lovely issues) to the Bustle & Sew Magazine is now just $35! That’s less than $3 (the equivalent of around £2.50) for each issue – mega bargain!! So if you’d like to receive twelve copies of the Bustle & Sew Magazine sent direct to your inbox at the end of every month then please just click the button below to purchase an annual subscription. Your first magazine will arrive straight away and your choice of kit will be posted within 5 working days (free of charge to anywhere in the world). And finally … here’s what some current subscribers have to say about the Bustle & Sew Magazine …. Helen, I had to write to say, “I am in love with your magazine.” This is the only magazine I have found where ALL the projects and info are to my taste. This is only my second issue, but I’m sure all future publications will be great. All your questions and possible concerns about subscribing and I do hope you’ll decide to try the Bustle & Sew Magazine for yourself. If there’s anything else you’d like to know, then please do email me using the contact page on this website.